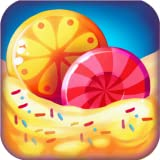 Candy Soda Pop Diamond Land Edition 2 - FREE PUZZLE GAME for Kindle Fire HD! Download match-3 mania app & you can play offline whenever you want, no internet needed, no wifi required. The best candies charm blitz game ever for kids is new for 2015!